H-E-B is recalling H-E-B Ode to Olives sliced salad olives in 10-oz. glass jars. The product may be contaminated with pieces of glass. There have been no injuries reported due to this incident. H-E-B is working closely with its H-E-B Ode to Olives Sliced Salad Olives manufacturer to ensure all safety measures are being taken when manufacturing the product. 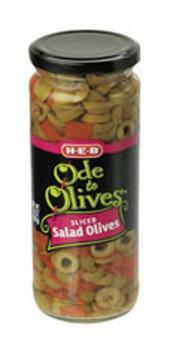 H-E-B Ode to Olives Sliced Salad Olives 4122094866 10 oz. The product was sold in all H-E-B stores in Texas. Customers who purchased the recalled product should return it to the store for a full refund.